Changes are afoot at the under-the-radar beauty retailer now that it's under the Macy's umbrella. Before I was a beauty editor and up to my crow&apos;s feet in gratis beauty products, I shopped at the small Bluemercury outpost in my neighborhood in NYC. I hated going to department stores, but loved playing with products, and there wasn&apos;t yet a Sephora nearby. (I credit the retailer with my Skinceuticals addiction.) Plus there were always indie and niche brands there I&apos;d never heard of. Fast forward several years, and there are now more than 300 Sephora stores in the U.S. (including two within walking distance in my neighborhood), as well as more than 500 outposts inside J.C.Penney department stores. While there are only 76 freestanding Bluemercury stores in the U.S. currently, that gap is going to start narrowing. Macy&apos;s purchased the under-the-radar beauty retailer back in February, and now the fruits of that relationship are starting to be realized. Marla Malcolm Beck, who founded Bluemercury in 1999 in Washington, D.C., is still the CEO and has retained all of her autonomy in the role — Macy&apos;s has remained pretty hands-off, she says. "If anything, the greatest resource is they have an executive recruiter who just works with me on hiring people," Beck laughs. "They&apos;re the number-one retailer of beauty products in the country. That gave us a lot of running room as far as how important beauty is to them and their desire to innovate." Macy&apos;s also has the money to help Bluemercury scale, and that&apos;s exactly what&apos;s happening. According to Beck, 18 new stores opened this year, and 24 are planned for next year. Most notably, though, this month Bluemercury is opening outposts within four Macy&apos;s — three in California and one in Texas. Macy&apos;s just opened a shop-in-shop with Korean beauty e-commerce retailer Peach & Lily, so clearly the company is trying to capture customers who are interested in unique beauty concepts. Sephora&apos;s had great success doing this with J.C.Penney. There is only a 20 percent overlap between the products that Bluemercury and Macy&apos;s sells, so beauty shoppers will have an incentive to wander into the shop-in-shops. 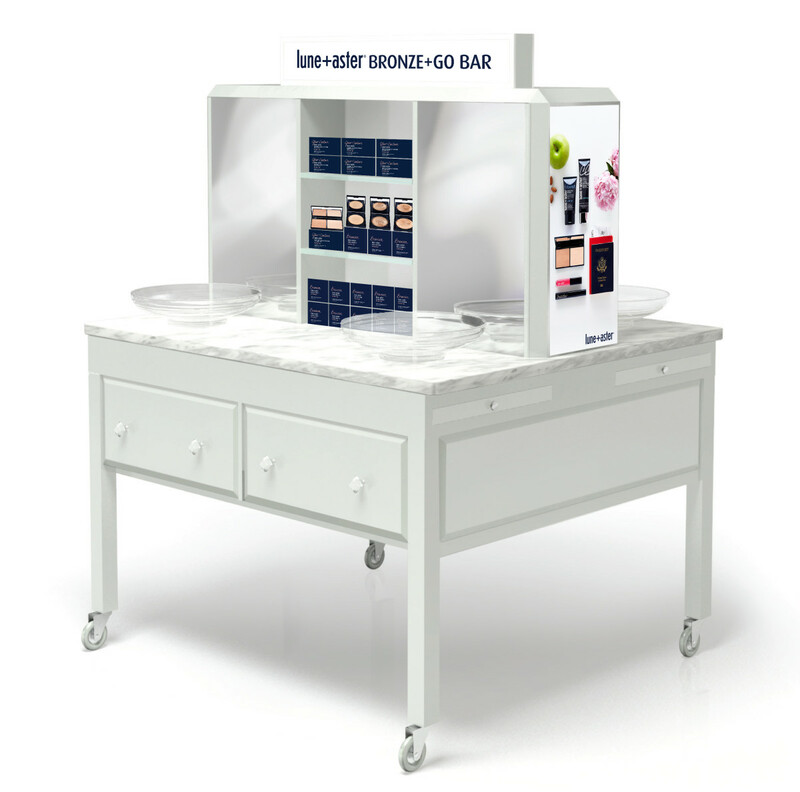 Plus, Bluemercury will offer spa services (Beck says the retailer performs 150,000 spa treatments per year at its existing locations), a first for Macy&apos;s. Bluemercury is also adding a new concept called "X-Bar," which will feature a single product — one will be a new brow product launch, for example — and a quickie five-minute treatment that customers can get in-store. At a lunch in NYC last week, the chief executive of Sephora Americas, Calvin McDonald, described a new concept store in San Francisco. It, too, features more store space dedicated to hands-on playing, including workstations for classes and online learning via iPads, more beauty studio seats for makeup applications and skin care stations with sinks. Beck calls her Bluemercury concept "quick, high touch beauty" and it&apos;s the polar opposite of buying beauty online or waiting for someone to get you a product from behind a traditional department store counter. It also seems to be the future of beauty retailing. If Sephora owns the color cosmetics market, then skin care is where Bluemercury excels. Yes, it carries color cosmetics brands like Nars, Bobbi Brown and Trish McEvoy, but "our strength is anti-aging skin care," Beck says. "We cover the age range from 25 to 70." Those all-powerful millennials — who are buying in droves at Sephora — are starting to come to Bluemercury, and they want one thing. "Millennials want eye cream. That&apos;s all they want," says Beck. "That&apos;s really the first sign of aging. They like the more novel products, too, like masks and oils." Beck says that teens are a surprising new demographic in the stores as well, because a lot of Bluemercury hubs are in the suburbs and they come in with their moms. It&apos;s often their first hands-on experience with beauty that isn&apos;t online. Beck just launched a color line, called Lune + Aster, designed as an alternative to more traditional makeup lines and their zillion product launches. She says it will help get you out the door in five minutes, and it&apos;s the antidote to every 30-minute contouring tutorial you&apos;ve ever watched. The four steps are prep (choose your primer), protect (add a BB/CC cream with SPF), bronze (self explanatory) and swipe (mascara and lip gloss). It will be interesting to watch the two beauty retailers as they evolve and come into more direct competition with one another. Regardless of the outcome, it&apos;s a win-win for consumers who want variety in their beauty offerings. Sephora keeps on top of trends and innovation, which is why it's one of the most successful beauty retailers in the universe. Sephora's newest initiative further illustrates its savvy; the store is capitalizing on the current obsession with nails and offering in-store manicures starting at the end of July. Karl Labelfeld strikes again. WWD announced on Tuesday that the designer would be launching a capsule collection of color cosmetics at Sephora. We were teased with images of Karl in a swirling gold snow globe, which is one of the items (why this is included in a beauty collection, we have no idea. It IS very beautiful, we suppose). Images from the rest of the collection hit the internet this morning, and it is amazing. From the eye shadow palette where each shade is shaped like Karl, to the nail polish (gold and black, obviously--please do a full nail polish collection, Karl! ), it is kitschy Karl at his finest. His new fragrance Karleidoscope is available now, too. However, we will all have to admire this collection from afar, because it will only be available at Sephora in Europe and Singapore, starting November 6. Click through to see the delightful collection.